A fter graduating from Royal Holloway, University of London in 2015 with a First Class Honours Degree in History and International Relations I began studying the Graduate Diploma in Law part time at BPP in Cambridge. 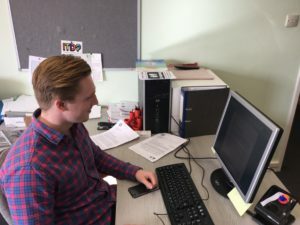 I had always wanted to pursue a career in law, and felt that by studying part time I would be able to gain some valuable legal experience to complement my studies. After doing some searching online I came across ISCRE. ISCRE appealed to me greatly as much of my degree studies were focused on the US Civil Rights Movement, and more specifically the Nation of Islam. As such, ISCRE presented the perfect opportunity to act upon my interest in racial equality, whilst benefitting my law studies. From the moment I started at ISCRE I was immediately involved in case work and have gained extensive experience of discrimination law as a result. I have been able to gain valuable experience of the law in practice through attending tribunals with legal representatives, as well as performing numerous tasks for case preparation and attending prison visits. ISCRE has provided me with opportunities which would otherwise not have been accessible to me and has helped me to develop skills that have benefitted me in my academic studies and everyday life. I have been volunteering at ISCRE for almost a year and am looking forward to a second.